Your quilt is almost done! You see the finish line ahead. 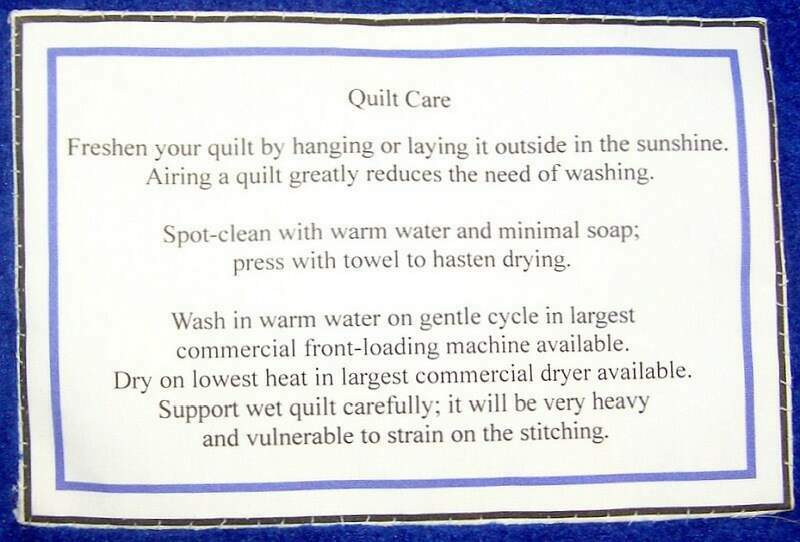 Do you really want to take the extra time to put on a quilt label now? Absolutely. In just an hour or two, you can create a permanent record that your quilt will carry with it as long as it survives. A good quilt label will identify your quilt and help tell its unique story to generation after generation. Anyone who receives, buys, or uses it in the future will thank you for recording the unique facts that make your quilt a bit of living history. This post covers quilt label ideas you can use in the next quilt you make. Your name (and the name of the person who quilted it, if you had it quilted by someone else). Phone number, street address, and/or email address for yourself or recipient. If the quilt gets lost, these specifics could help you get it back. Use a computer and ink jet or all-in-one printer. You can design a custom quilt label using any computer graphics program, including any photos, special fonts, or any graphic elements you’d like, then print the label on a pretreated printable fabric sheet. You can find printable sheets at any quilt shop or large craft store. Many brands are available, such as Miracle Fabric Sheets, Vintage Workshop, and Color-Plus Pre-Cut Fabric Sheets. It’s also possible to make your own printable fabric sheets and print the label on them. Make a new block out of extra fabric. 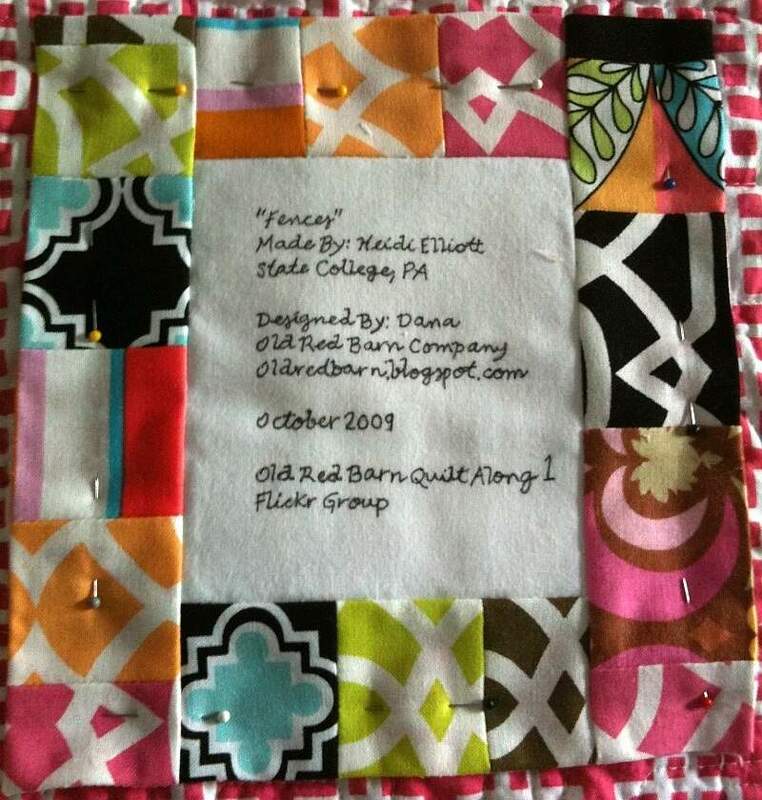 Nancie V. of the Stashbuster online quilting group used scrap fabric she had in her sewing room to sew a label block. She used a printer to print the text of her inscription onto a piece of paper. Then she laid the label on the paper over an improvised light box (cleverly made by putting a dome light under her clear acrylic sewing machine extension table), and traced the printed letters onto the fabric with an indelible pen. You’ll want to place your label somewhere that it won’t show if the quilt is hung up on a wall or laid out on a bed. Many quilters like to put it on the bottom right corner of the quilt’s back side. To discourage a potential thief from removing the label, sew it firmly to the backing fabric before you assemble the quilt, then you can hand- or machine-quilt right through the label. Another suggestion I’ve read (but haven’t yet seen in real life) is to make a triangle by folding a fabric square in half. Write the label information on the triangle, then bind the triangle right into the corner of the quilt, the way you would to make a quilt hanging triangle. You may still want to whip stitch the angle of the triangle so the label doesn’t catch on anything as the quilt gets used.